And there it is, for the fourth year in a row: MSXdev, the annual MSX1 game development contest that took the MSX community by surprise. After a slow start, MSXdev'04 resulted in 16 new MSX1 games, whilst MSXdev'05 even surpassed that success with 21 brand new MSX games for the whole community to enjoy. Contestants from all around the world sent in their contributions, including real new-classics and near to professional quality productions. Now, the time has come for MSXdev'06!. Eduardo Robsy, founder of the MSXdev contest, and the person responsible for its huge success, has decided the time has come to hand his task over to a new team: the MSXdev Team. Their goal is to organize new contest, trying to maintain the original spirit that boasted the success of the previous editions. On Robsy's MSX Workshop you can find more information on Robsy's reasons to move on. It is allowed to use additional hardware like SCC, MSX-MUSIC, GFX9000, R800 et cetera. This time those add-ons will be taken into account when judging the entries, even giving them extra points! So, for now, people can start developing their MSXdev'06 entries and -like in previous editions- sponsors are free to contact the MSXdev team for offering new parallel contests, following the same sponsorship system we saw on the last edition. At the moment there is only one nice prize to be won: a Panasonic FS-A1GT MSX turboR computer! So, there we are, already looking forward to the new pile of MSX games that is going to be released in light of this competition this year. Developers: you have more than 8 months left to develop your games so you have no excuses. Happy developing, and good luck! Needless to say, we're in again ..
Fast and nicely corrected post . Thanx for reporting that fast!. And the most important thing: every MSX developer around the world, start your projects! . As you may expect, Karoshi Corp. will join too with some games!. Let's the game creation begin! /me waits for MSXDEV'07, which will have a seperate category for MSX2 games? It's probably either ASCII (8 KB or 16 KB) or Konami (without or with SCC). What is the penalty for not being compatible with later MSX models, such as MSX2+ or Turbo-R? I understand that its nice to have games run on all MSX generations. Just unfortunate that they didn't make newer MSXes fully backward compatible. But I guess its not too hard to not use those non compatible features. I just wanted to make sure what the rules are before starting coding something too MSX1 specific. Remembering your last MSX1 demo, I'm pretty curious to see how far you can reach with a game, dvik . I really hope this time you consider joining the contest . Although I'm certainly a fan of hispec games and demos, I like the approach of MSXdev a lot: taking one step at a time, whilst always supporting every single MSX computer in the world... I hope (and expect) the new MSXdev team will continue the success of the previous editions, and am already looking forward to games as original as Cheating Wives and Parachuteless Joe, or games as stunningly professional as The Cure and Universe Unknown. Way to go, guys! Hey viejo_archivero! Your English is not that bad mate, what an overflow of text! Happy to see news like zis won. I mean, bugabuga for everybody! I'm personaly a little disapointed with the 128KB and the extra points for MOONSOUND, GFX9K etc. Please remember that it are mostly individuals (or small groups) who also want to compete. Removing the original restrictions from a nice addition to bonus points is making it a team only competition. I can't possibly imagine one person doing a decent game with: psg/moonsound/fm-pac with alternate GFX9000 graphics. I would say just stick with the old rules. Let developers use their creativity to get the full out of the MSX1 and focus on gameplay and don't judge the 'fancy hanky panky'. Or are there are lot of groups around who have the time and manpower to develop MSX games? Good luck to the MSXdev TEAM and congratulations for the new site and the new MSXdev'06 contest. As a part of Karoshi Corporation I will join it for sure! I am so happy to know that MSXdev will go on. For me it has been a pleasure to organize the previous editions and I will keep all the good moments that we all have shared. The most important thing is that we will have more and more games coming every year. That was my original goal and it think that we have done it. This year edition will be the full consolidation of the contest as one of the most important MSX events. My best wishes to the MSXdev TEAM! Kind regards to all MSXdev contestants and thank you for your efforts! @viejo_archivero: I'm just a little disappointed. All those fancy stuff is the main reason most of all efforts in the past to make a game have failed. I believe it's just distracting. We'll just have to see to know. Good luck to the competers! Actually, additional support for all the extra expansions is tricky, where to store all that stuff in ROM or/and where to unpack it to with only 16kb RAM? I think for our game we'll have SCC for bonus and some MSX2 palettes.. these won't take up too much extra data..
For some reason I expect this year's games to be kinda like that.. psg and fmpac/scc as bonus, and in case of MSX2: switch to sc4 with more sprites and a palette as bonus. MSXDev´06 will be one of the greatests events on the MSX scene of this year.Can´t wait to see the games involved in this contest! support psg only? In this case the scc is not an add-on is it? Or does this mean you get one bonuspoint for the scc and one penaltypoint for not supporting psg? One more time I will offer the code and binaries of Cosmic Battle, a unfinished enter from the last MSXdev. @GhostwriterP: the same answer than the one I write for dvik: if you only make SCC musics for your game, only an MSX with an SCC cartridge plugged in will be able to play your musics (if not, then there is NO musics): that's not what I call "high compatibility" . ghost: the latter one I think.. I think they jury will give his/her primary points to the msx1/psg/16k config and bonuspoints to any additions. The pure msx1/psg/16k game is what makes the main/minimal body of points..
Huey, I think you are not facing the reality. You speak and live into the past. As former user from what you called fancy stuff it is a fact that since 2003 till now we sold again 50 moonsounds and lately the demand for GFX9000 is increading especially from Brazil. Besides the sellings active contests as this stimulate , the improved emulators that support a moonsound, the return of the cartridge feeling make it even necessary imho to let people profit from those extra's. That all is changed is since let say 1995. Even more important is that it test skills of supporting extra ram,slotsupport( moonsound /gfx and even scc run from another slot, if it an emulator or real. To use all directly I agree with wolf , that is not necessary. But as viejo already said , please do it your own way. need a scc to be plugged in since it is already in the rom. It also crossed my mind that if you make a game that uses gfx9000 only, it could verywell be compatible, just as long as you state it needs a gfx9000 module. There are also eye-toy games being sold without an eye-toy-camera right? @Sunrise: Maybe your right. But in the past I/we started about 4 GFX9K games but they never finished due to to high demands and lack of time from our side. I was one of the firsts to buy the Moonsound and GFX9K (The boxless versions ) and really want to see some game for the GFX9k. But I think the MSX-scene is to small and the posibilities (hardware wise) are too numerous to cope with nowadays. There's a lack of gametools for the msx-scene to use. Mapeditors, gfx-editors and the like.. I figure ppl make their own tho. Ghost: how did you map The Cure btw? Also, the G9k was marketed a bit like "easy to make games" etc. etc. That gave the impression that all the owners should make games easily and they could therefor go 'a step higher'. Well, the truth is that the gamelogic isn't easier. Sure the gfx are better, faster, and easier to code, but does that make it easier to make an RPG or a shooter? Ofcourse not, you still need quite a big system for all the events and logic. GhostwriterP: yeah, I get it. You mean that your ROM would be intended to have a built-in SCC inside... but that's all imagination as long as you don't create the physical ROM the way you want and distribute it with the SCC. 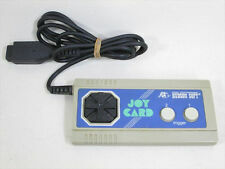 If you JUST release a .ROM, you'll need an SCC somewhere if you want to play it on the real thing with the original bgm... but, anyway , the thing is to get the original spirit of the contest, which is that [/i]all games should be all MSX compatible[/i] (with add-ons when particular hardware is found). Other lectures that differs of this main goal of the contest are a clear misunderstanding of the purpose of the contest itself . How about transforming the winner entries into real carts? wolf_: Notepad. The stages are just a bunch of line drawings. ah, so some kinda macro/script or something? omg, must 've taken some time.. didn't you prefer a visual editor or something (with the same macromethod, just immediately visable) ? "wolf_: Notepad. The stages are just a bunch of line drawings." I reciently discussed with someone if it The Cure stages where macro-tiles or were "drawn". I guess I was right . I also brought the idea to edwin during UU, but we stuck with normal maps and bitbuster. Tho I still like to try this method some day.. Ghost: can you share any figures on average map-sizes per screen? each theire own dimensions (pset or tpset). So a bit of both I would say. those. And then there are some bytes for the shared backgrounds varying a lot (5-96). Adding all that stuff up I would say 128 bytes, but then also softsprites are taken into count. All is also bitbustered (using our own buster) so it is a bit smaller. Thanks for all the reactions : as member of the MSXDEV team, I'm not really surprised, this contest has proven since 3 years his utility, giving chance to develop new games ! Of course, it is also the result of the great impulse given by pitpan and the MSXDEV team will always try to keep intact the spirit of this great contest that should had never existed without all the efforts of pitpan. viejo_archivero has already explained that in some of his answers, so I don't need to say more, only the fact that the rules are evolving each year and that for the first time, all non-MSX1 additions will be give extra points ! I'm pretty sure that the 2006 edition will give many interesting new games and some good surprises ! What concerns the website, viejo_archivero has made a fantastic work and I'm very happy to host such a beautiful site on my ever growing domain msxblue ! Another minor question. Is it allowed to use V9958, msx-audio and msx-music? These are also kindof an extension and should give bonus points, right? Again, I just want to make sure before start planning how to implement my idea. It is indeed allowed (as we have mentioned 'et cetera' in the extension list), but keep in mind the compatibility with the MSX1 machines to avoid penalty points. So it means that your game can include a VDP type detector and an extension detector, so it can be runned differently if the MSX2 VDP and the music extensions are detected without losing the compatibility with the MSX1 VDP and the PSG. The same of course for the MSX2+ VDP or the R800 ! Yes, dvik . Is allowed to make use of these extensions AS LONG AS they are offered to the player as add-ons to the game. In other words, the game shouldn't REQUIRE those extensions to run, show graphics or play musics... so, the game should be 100% playable/viewable/audible on a plain 16KB RAM MSX1. Ok, think I'm starting to understand the rules. Bonus points is given to the use of 'extra' features but if the game depends on these features it will be minus points. So for example if a game supports GFX9000 and Moonsound as an extra feature it will be given bonus points as long as the game also runs on a plain MSX1 without these features. Is that correct? "Wolf_: If it doesn't run on "msx1, 16k, psg" then you failed and the timespace-contiuum explodes. ^_^"
A 128k ROM that keeps to the MSX standards? Um, there is no MSX standard for 128k ROMs... So, what do you mean? I'm a bit confused about the rom standard and if there really is one. To me it seems like game companies needed more memory for their games and they invented paging and implemented it somewhat different (konami, ascii, koei, ...) but does the MSX standard really tell how a cartridge should do its memory mapping? I guess the main reason why there weren't any MSX1 games with mapped carts is a cost issue. I bet it would have been quite expensive to make a 256kB mapped cart in 1984. I was thinking the same thing. For most extras it's pretty clear. But for a 128k game you need a mapper, which is as much external hardware as anything else. In fact, there is little scc difference between a mapper and a standard scc chip as both are delivered in the cartridge with the game. It's probably good to make some explicit mention in the rules of what exactly is considered to be part of the base features. A cartridge is indeed a piece of hardware but if it has a mapper or not doesn't make it more or less MSX1 compliant. On this point I think the rules are really clear actually. The media should be a cartridge with at most 128kB read only (?) storage. Earlier msxdev's had the same media but restricted it to non mapped carts iirc. Maybe a good idea to only allow certain common mapper types that work well with e.g flash carts so users can run the game easily like the once mentioned earlier; ASCII8 ASCII16, Konami. But I guess its also good to mention whether SCC is allowed as part of the base package (and if it is, what about carts with built in DAC's for example). SCC is not part of the MSX standard, it was added later only by Konami on some cartridges. What concern the mapper, you can choose any kind of mapper ... but it must work with all types of MSX computers. The point is, if it must work on all MSX computers, and the game has a 128kB mapper, you need to put it in a physical cartridge to make it really work. Maze of Galious doesn't work without the mapper mechanism in the cartridge. Just the ROM file is not enough! The code in the ROM file makes use of the characteristics of this mapper (the normal Konami mapper type), by writing values to certain addresses, to switch ROM banks in the cartridge. Even non mapped carts have certain characteristics that may make them unusable outside a cartridge, for example an 16kB rom that is mirrored and this is actually used by the game. In this case, the cartridge makes reads to address 0, 0x4000, 0x8000, and 0xc000 return the same value. This is of course just because the higher 2 bits are not connected to the rom chip. But even a 'feature' this simple does require that the game resides inside a cartridge to run properly in all cases. So there isn't really any fundamental difference between a 16kB mirrored cart and a Konami cart. Both have some hardware specific characteristics that a game may or may not use. To make it easier for users I think it would be good to restrict the mapper to one of the more common once so the game can be run on a real MSX with MegaRam, FlashRom or something similar. Or at least give minus points for using a custom made mapper that is not defacto standard. Oh, and please don't call it Konami 4 and Konami 5... They are just Konami with and without SCC... No reason at all to use the 4 and 5; in fact, these are just numbers made up by Marat Fayzullin to number the ROM types in fMSX. The only thing to take into account is common sense: for example, it won't make sense to use SCC sound and use a ASCII mapper. My choice is by far Konami SCC mapper -or even better- Konami SCC+. Both supported by the upgraded Konami Sound Cartridge [includes SCC-I], MegaFlashSCC [includes SCC], Padial's flash cart, ESE Artists' cartridge and MegaRAM. Anyway, I would suggest not to use the extra space for static images and sampled sound. Instead, make the game concept more detailed. More fun, less intros! Corrected. Everything clear now or not? That document is maintained by me. I've gathered some more detailed info on the ASCII mappers which be updated in the near future... so it is updated. Then congratulations for your work, BiFi! It is THE reference regarding MSX ROM mapping devices. Btw, the first entry for the MSXdev'06 has been just announced!. Read more in this forumpost! Is there a deadline for registration you project or can I just register 3 days before submission date? Huey: you can enter a project in the contest everywhen before the deadline (31st dec.). Anyway it's nice too if you decide to send your entry while developing the game in order to receive some feedback from MSXers all around the world!. It's up to you to reveal it or to mantain the surprise until the final day! Is the game cover also concidered a part of the entry (e.g. can a good cover give bonus points)? Nope. It should be submitted with each entry, but the only thing judged is the game itself, not the sticker. The same goes for the instructions. The Padial's flash cart is an ASCII 8/16 mapper, not a Konami one. Furthermore I think the ASCII mapper is standard (or at least it's the one used by most of the comercial MSX cartridge of different brands). That's the reason I consider the ASCII mapper is "more MSX" then the Konami thing. AFAIK, Padial's flash can emulate any mapper by adjusting the jumpers, but I haven't used it. I use ESE carts and they work very well. They come in two flavours, one ASCII8/16 version and one SCC. The most common mapper is ASCII8. ASCII16 is actually not that common but could be handy depending on how the memory map of the game looks. what is the .ROM format that an ASCII8 rom should have? what is the header? how rom pages are stored in the file? a ROM mapper is basically the way smaller parts of a whole ROM are switched. Such a ROM works exactly the same way, with the difference you need to add some code to switch to a different part of the ROM where the required info is stored. Depending on the ROM mapper used it can be done using addresses or I/O ports. For more detailed information you might want to check out this page. the start address (I guess). How do the emulator allocate the extra rom pages in case of a mapped rom? pages are seen one at #4000 and another at #8000? The first 8/16 KB are page 0. The rest follow sequentially. Only page 0, that usually is located at address 4000h, requires the ROM header "AB",init_address. The very first thing to do is to locate the subslot/slot ID for page 2 (8000h) and set up the appropriate ROM pages. I know the explanation is not clear. There are physical pages (0-3, corresponding to 0000h to C000h) and ROM pages, with a size defined by the mapper type. But think of it as an "extended" 32 KB ROM. how to do a ".rom" file that contains an ASCII8 rom of, let say 16 pages, to be loaded in openmsx ? should the .rom file have an header ? It's just loaded The ROM file has a mapper type (either specified or guessed). This determines how the mapper is handled, depending on what the code does. See BiFi's link. The ROM file does not have any special header. It's just the contents of all pages in the right sequence. One page has an AB signature. This page is put into the normal Z80 address space in the slot in which the ROM is present. It will be found by the MSX BIOS ROM and executed. The code in the MegaROM can switch the pages of the ROM by using the methods described in BiFi's page (e.g. : writing a value to a certain address in the ROM triggers the mapper hardware in the cartridge). Is that clear enough? If you need more details, I hope someone else can answer, because this is about the level of my understanding of this. Manuel's reply is basically correct, I'll just sharpen it a bit. ROM files do not have any header at all. They contain the raw data from a ROM IC, using the addressing of that IC. For ASCII8 this means the first 8K of the ROM file is mapper segment 0, the second 8K is mapper segment 1 etc. For development, option 2 is not useful, since the checksum will change every time you change something in the game. Option 3 is not that great either, because openMSX might guess wrong, selecting the wrong mapper type and your game will hang, while you might think it's a bug in the game itself and waste time on debugging. Therefore I advise you to use option 1: specify a mapper type explicitly. You can do that in Catapult, or on the command line: "openmsx coolnewgame.rom -romtype ascii8"
And one more thing: the "AB" signature for booting the cartridge should be at #4000 after reset. In most (all?) mappers that means you should put it in segment 0. Same rom detection model in blueMSX. As mth mentioned, its best to explicitly set the mapper type during development. In blueMSX you do it in the Files page in the Properties dialog. I guess a non-mapped 64kB does not have the AB signature in the beginning of the rom but thats the only exception I think. All (I think) mapped roms have the AB signature in the first page which would be in the beginning of the rom image. UPDATE: A new entry for MSXdev'06 named Cyberware: Chapter IV ~ Katarsis episode II ~ by TNI - The New Image has been submitted! Is it allowed to have your own WIP page somewhere. Or is it agains the rules to expose anything of the game (graphics screenshots /music snippets or specs /development choices etc.) while in development? Nope, it is perfectly legal to show your progress wherever you want, AS LONG AS you do not distribute public betas of the game, as it is stated in the rules: "Do not redistribute neither unfinished or finished versions of the game before the end of the contest." and "Beta versions used for debugging and testing purposes are allowed, but they should be only distributed to beta-testers." A non playable demo or a movie is allowed isn't it? I never understood why someone would release a playable demo other than a commercial purpose. Wolf_:"Do not redistribute neither unfinished or finished versions of the game before the end of the contest". This implies both playable and nonplayable demos. With videos of the game running I guess we can accept them, as they aren't a (partial) MSX software release (like a demo). So I think screenshots, videos and MP3 files, for example, are acceptable, but MSX (non) playable demos are not allowed to be released before the end of the contest. what is teh difference between a nonplayable demo and a video ? You do not see any difference between a non-playable demo and a video ?. Well, if you need the explanation : a non-playable demo would be previously unreleased MSX software (with the (partial) game engine inside), and a video is a pre-recorded sequence of screenshots. do you mean that the non palyble demo can be reverse engineered by some unfair competitor? ... I mean it is a pre-release (no matter if playable or not), so it is not allowed as it is stated in the rules. Ah well. It is much more fun just to surprise everybody than to hype your game. And Wolf knows exactly why he comes always at the very last moment with a big surprise ! Yeah, because we always start too late (UU), find editorbugs the day of the deadline (Sphere) and sometimes miss deadlines anyway (Wings). Is there someone who has planned to use pcmenc in its developement ? PA: requires quite some advanced artwork, and you can't do much else around this concept.. it'll become like PA quite quickly. Shooters are tough to make! Period! Platformers are prolly easier to do (we've yet to start ^_^).. easy choice then! - is it really a challenge? - how to fill a megarom with a puzzlegame, other than flooding it with oodles o' artwork? - ppl might 've seen enough Tetris on MSX for the first 45 years to come.. I expect to have a bit more breathing space codewise. In the shooter everything was very tight, few cycles left to do something really special. Of course the main reason to do a platform game is that I didn't want to code another shooter again. Plus, something with a less flimsy story would be nice. But the term "platform game" doesn't really narrow it down. There quite a few ways to make one. And we plan to be different from the rest. I love platform games!!! More than shooters. Well. You'll be a happy gamer at the end of the year . Boulder Dash clone will make it for the actual edition of the contest. Less than one month after his launching, the 2006 edition of the MSXdev contest seems to become really a great edition, as 6 entries have already been announced and we guess that other projects are also planned, but for the moment kept in private area. The 6th entry is made by the founders of this great challenge, Karoshi Corporation (Jon Cortazar and Eduardo Robsy), who have released in the previous editions a total of 8 games (Duck Hunt, Factory Infection, Griel's Quest for the Sangraal, Guru Logic MSX1, Picture Puzzle, Saimazoom, Snail Maze, Soukoban Pocket Edition). Time now for another different genre entry, one of the top genres in the most wanted games for the MSX: a brand new RPG ! Prepare your armour, weapons and magic spells for Monster Hunter ! This 7th entry for the MSXdev'06 contest is very promising as it will include a turn based fighting system and SCC music ! The team entering the contest with this promising game, Nerlaska Studio, is new into the MSX development, but expert in developing videogames for PC, mobile devices and even PlayStation 2, as you can check in their corporate website. The author of this project started to code in 1988 with his MSX-1: now, he decided to enter the MSXdev contest with this good looking MegaROM ! Im realy hoping for some other screens of the entries. Are they kept secret for a reason? Mmmkay. I just think the title screen thing is a bit akward. Isn't a title screen the last thing to do on a game? I'd rather see some concept gfx. mhoa dunno, I think it's fairly logical. The titlescreen is something to hold on to, kinda like a summary of the story. If one thinks of a new concept/story, one typically needs to fold it into something. This titlescreen could be like a protective box you could put the game into. I even wonder whether you should have a titlescreen at all Movies usually start with opening-titles, and for some older movies an overture of the music. More recent movies 'just start' and have *all* the credits in the end-titles. It's just a way of doing things..
Too bad the end-titles are cut-off @ TV-broadcasting, due being in the way for those glorious commercials, and in the cinema everybody leaves their seats as soon as the first end-titles word shows-up. Bastards! This way credits are never seen. Hmmm. Should it work if you embed the credits and title in the game itself? You can check some unveiled in-game gfx at Karoshi development forums. In the same thread you can see some gfx concept for a game that will probably enter the MSXdev'06, 'Tam Tam Twins' form Paxanga+various developers. uhm.. where can we O_O at those gfx? So please be patient, I have some homework to do first ( looks at ARTRAG ). I will put a screenshot of the level-editor (thanks to wolf_) on-line after that. but uhm.. exactly what did I do to get this mention in context of a 'map-editor' ?? what about a multigame ROM with the best of msxdev 03-06? can be done? at what cost? Ok here's a little preview of my gfx. These are just concept gfx so there isn't al lot to see. Apart from the spikes I don't have any enemies (patterns) yet. But I do have some sprite enemies; but I'm currently making a sprite editor/animator/manager and a tool for pattern enemies. Nice graphics, Konami-like!. Keep on, Huey! With 3 months left for the deadline the contest is really alive!. Here we have a new MSXdev'06 entry, the 2nd one from Nerlaska Studio but with RC743's concept and direction. Now it seems we have a remake from a classic but with an MSX twist: it is time to announce MSX Invaders!. With Monster Hunter, this is the 2nd entry from Nerlaska Studio, now with an idea from RC743, who will make the graphics too (Mars Lander, Drink-It) and Dop, who will compose the musics. In this freestyle version from the all-time classic Space Invaders with a nice parody touch, we will be able to play with 4 well known MSX heroes: Pentaro, Mr. Ghost, Randar and Joe (from the hilarious Paxanga game Parachuteless Joe). We will surely keep you informed about this funny project!.